Zip up wetsuit style stubby holder that will fit most stubby size bottles. It is manufactured from laminated open cell foam material which has powerful insulation properties to keep drinks cool as well as preventing cold wet hands when holding chilled bottles. 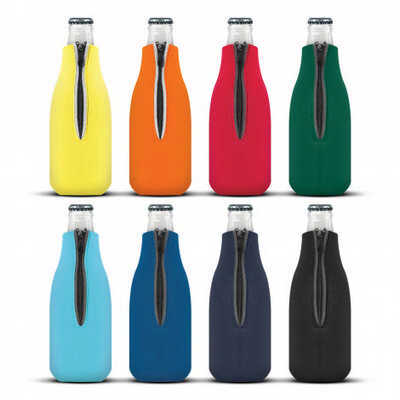 Bottle Buddy is supplied flat packed for economical transportation and storage. Colours: White, Yellow, Orange, Red, Bright Green, Dark Green, Light Blue, Dark Blue, Navy, Black. Dimension: H 200mm x W 108mm. Print Description: Front - 45mm x 65mm (one colour). Print Type: Screen Print. Packing: Loose packed. Price includes : Printing Per Position. Setup is included.